When planning your exhibitions one of the largest potential expenditures could be the exhibition stand itself, if you are planning to attend multiple shows and make repeated use of the same stand then outright purchase is a simple decision to make, but what if you are just starting out, or are not sure how many exhibitions or conferences you may attend in a year? Whether you are testing the ground to see whether exhibitions will work for your business, if you only plan to exhibit once a year or hope to change your graphics regularly, then stand hire may be the best solution for you. There are a range of fully customisable, pop-up stands, modular or custom options available to you, so we can find the right solution to fit your business. 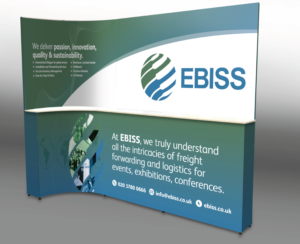 As with all events, planning is key, so if you are considering this option, please get in touch and we can reserve the relevant stand frames for you. Reason 1: Flexibility – you are not stuck with the same exhibition stand design for every event and you can customise it to fit your event and your brand. Reason 2: Convenience – you tell us what you want & we can do the rest! Reason 3: Budget – for one-off shows the investment is minimal if you rent versus purchasing a stand outright. Enabling you to go bigger on impact, without impacting your budget. If you need any further convincing, here are a selection of the rental options available from EBISS to mix & match as needed. A rental stand doesn’t have to mean small! For example, we have this lovely elegantly curved 2m tall stand which fits beautifully into a 3m x 2m space and includes the handy shelf, we can even add a 42” TV screen onto the back wall for you. The graphics are fully customisable, we send you the blank templates for each panel, you add your designs then we arrange all the printing for you. This can usually be achieved within 2 weeks from receipt of print ready artwork. The stand is then assembled in our warehouse, we can send you photos at this stage so you can check you are happy with everything. It will be thoroughly checked then safely packed away in its custom packing container ready to be sent directly to your event venue in perfect condition. Our expert installation team can even be there to erect it for you, so you can simply walk on to your fully built stand on show day! If your stand space is going to be small, then a simpler approach may be better suited to your needs. This illuminated rectangular T3 stand and counter really packs a punch but only requires a very small footprint. Each piece is comprised of a strong & light metal, click together frame, fabric covers, wandlights and a packing case. They can be used with or without the lighting, but the backlit wall and counter give a real impact – and that’s what you are looking for isn’t it? 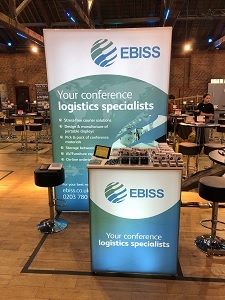 This stand and counter combination works particularly well for conferences, and the counter provides convenient storage for literature or giveaways whilst keeping your stand clear from trip hazards. Once you have your branded wall or lightbox organised, what other equipment are you going to need to complete your stand? We have a range of furniture available to hire such as chairs, stools, tables and other storage items. If you are going to have literature to display or hand out, we have floor standing literature racks to help you keep everything in order. Let’s hear it for TVs! Let’s face it, screens attract the eye, so what better way to catch your customers attention than with a built-in audio-visual equipment such as a built in TV screen? You can have your presentation running, reinforcing your brand, highlighting key information and brand messages. We have flat screen TVs available to hire – these can be either floor mounted, or depending on your stand, they can be mounted on to the back wall. 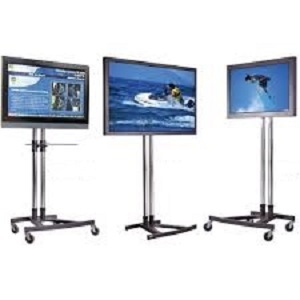 Flat Screen TV’s – can be floor standing, desk or wall mounted. 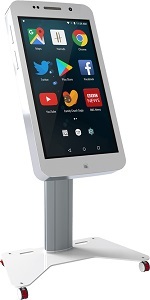 We have a massive 42” giant iTab (think giant smartphone with a touch screen) which is floor standing and can be loaded with your details, website, catalogue or whatever you need. This can bring a fantastic interactive element and most definitely adds a little extra WOW to any stand. Another major benefit of hiring, over purchasing, is that after the show, you simply return it! No storage space needed, no ongoing maintenance costs for you – you can just sit back and bask in the glory of your successful exhibition event! If you have an event coming up that you are considering, let us know what you are looking for and we will help you acheive the stand you are dreaming of within your budget, deliver it to site and even erect it for you, if you need us to. Our job is to make the logistics in your life easier!